Samsung will unveil its next-generation Galaxy S10 smartphone range during its Galaxy Unpacked announcement on February 20, 2019. Galaxy S10 handsets sold in the UK, Europe, South Korea, India, and other global markets will be powered by Samsung’s own Exynos 9820 processor, while the Qualcomm SnapDragon 855 will be used in devices sold in United States and China. Ahead of the launch event next month, Samsung has published a lengthy blog post on its website talking up the advantages of its new silicon, and some of the new experiences it will enable on its new smartphones. According to Samsung, the Exynos 9820 will usher in a "new era of mobile experiences" thanks to the increased processing power, multi-gigabit internet speeds, and new multimedia features enabled by the new chipset. The blog post is clearly designed to drum-up consumer interest in the forthcoming Galaxy S10, by hinting at some of the improvements coming to the flagship phone. First of all, the new processor should result in better battery life compared to the Galaxy S9, and Galaxy Note 9. According to Samsung, power efficiency is 40% improved compared to the previous generation Exynos chipset, which is a huge leap. Coupled with the larger battery cell widely-tipped to be fitted inside the Galaxy S10 – 3,500mAh compared to 3,000mAh inside the Galaxy S9 – we could see battery life measured in days rather than hours. 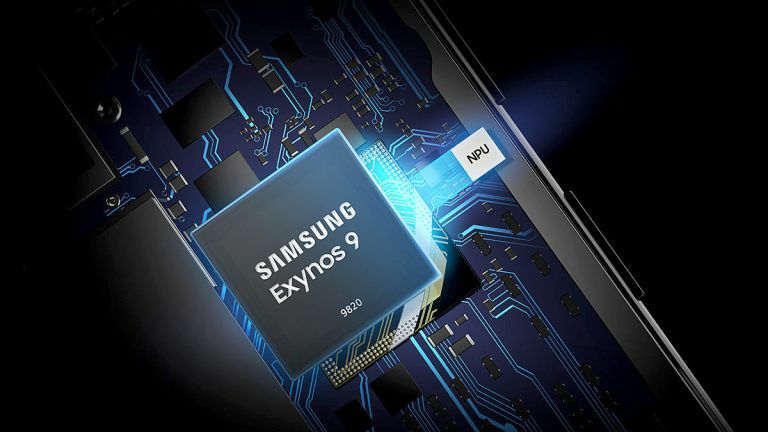 Exynos 9820 is also the first Samsung system-on-a-chip that sports a dedicated AI chip, following closely in the footsteps of Huawei’s Kirin 980 and Apple’s A12 Bionic. Separating the AI functionality from the main CPU should speed-up a whole slew of everyday smartphone tasks, like opening applications, playing resource-intensive video games, and taking photographs and videos. Not only that, but Samsung claims this approach could also result in "stronger security than when utilising the cloud". Samsung is also keen to highlight the fact that the Exynos 9820 can power up to five camera sensors, up from four with the Exynos 9810. For those who haven't been following the recent torrent of leaks from the Samsung supply chain, this is another nod to the fact that the Galaxy S10 Plus is now widely believed to have dual front-facing cameras, as well as the same rear-mounted triple-camera as the Galaxy S10. Aside from the sheer number of cameras, Samsung has also talked-up the new capabilities of the Image Signal Processor (ISP) built into the new chipset. According to the Seoul-based company, the ISP will vastly improve the quality of images. It says: "when a user clicks the shutter button within the camera app, billions of arithmetic operations are performed by the advanced ISP to generate better focus, accurate exposure and white balance, vivid colour and less noise, producing amazing photographs." The Exynos 9820 is able to record 8K video, something that Samsung is at pains to highlight in the latest blog post. However, this is one feature that's very unlikely to appear on the Samsung Galaxy S10 since the SnapDragon 855 doesn't support video recording at the same pixel-packed resolution. Samsung is unlikely to offer the feature in some markets, only to deny smartphone owners with models powered by the Qualcomm silicon the same experience. Unfortunately, Samsung stops short of confirming some of the latest rumours and whispers we've heard about its new flagship smartphone series. The latest leaks suggest there will be three separate models of the Galaxy S10: Galaxy S10E, Galaxy S10, and Galaxy S10 Plus. The former will be a new affordable version to appeal to customers turned off by the rising prices of the hugely-popular Galaxy S range.